Kalhana tells us that King Avantivarman (AD 855 – 883 AD), the first king of the Utpala dynasty had a foul mouthed son who didn't have taste for high poetry. He tells us S'amkaravarman (Shankaravarman, A.D. 883-902), son and successor of Avantivarman founded a new town called S'ankarapurapattana and built two temples at the place dedicated to Shiva. The new king named one of the temples after his wife Sugandha as Sugandhesa. After early death of her two boy kings, Sugandha too got to rule Kashmir from 904 to 906 A.D.
Kalhana mentions that just like a bad poet steals material from other poets, a bad King, plunders other cities. S'amkaravarman plundered the nearby Buddhist site of Parihaspora to build his new town. 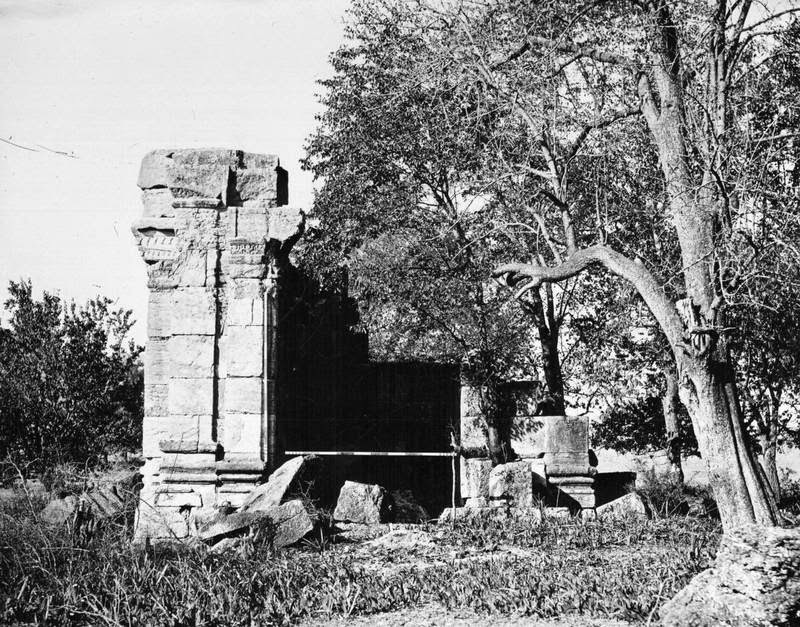 The stone of the temple came after the ruin of Parihaspora, that happened just around 150 years after it was founded by Lalitaditya (697-734 A.D). According to Pandit Kalhana, it was the evil deeds of the King that lead people to forget the real name of this town and instead have them call it simply as Pattan [Stein, 'the town'. Cunningham, pandits wrote it as 'Paathan', 'the path' as it falls on the important route to Varahmula]. Kalhana mentions that the fame of the town rested not on the temples but "what gave fame to that town was only what is still to be found at Pattana, — manufacture of woollen cloths, trade in cattle, and the like." In 1847, the two temples at Pattan were identified by Alexander Cunningham (1814-93) as the ones mentioned in Rajatarangini. Based on the fact that one of the temples was smaller and less decorate that the other, he marked it as Sugandhesa temple. At a distance of about 25 kilomoters from Srinagar, this is the first major historical monument that one runs into while on way to Baramulla on national highway NH1-A. 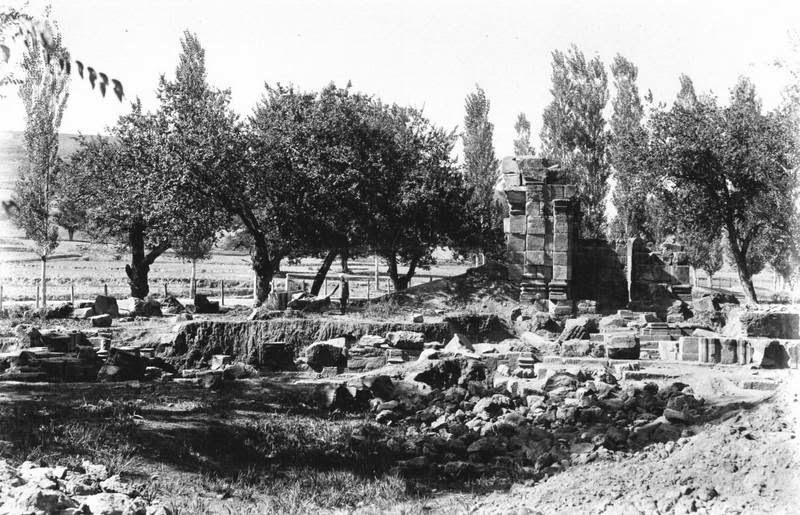 Photograph by John Burke for Henry Hardy Cole's Archaeological Survey of India report, 'Illustrations of Ancient Buildings in Kashmir' (1869). The shrine is 12' 7" square and has, as usual, a portico in front. It is open on one side only, and has trefoiled niches externally on the other sides. These niches contained images. The temple stands on a double base, but it seems probable from the flank walls of the lower stair and the frieze of the lower base, in which the panels intended for sculpture decoration have been merely blocked out, but not carved, that the temple was never completed. The entrance to the courtyard is in the middle of the eastern wall of the peristyle, and consists, as usual, of two chambers with a partition wall and a doorway in the middle. Among the architectural fragments lying loose on the site, the most noteworthy are (a) two fragments of fluted columns with their capitals, (b) two bracket capitals with voluted ends and carved figures of atlantes supporting the frieze above, (c) a huge stone belonging to the cornice of the temple, bearing rows of kirtimukhas (grinning lions' heads) and rosettes, and (d) a stone probably belonging to the partition wall of the entrance, having (1) two small trefoiled niches in which stand female figures wearing long garlands and (2) below them two rectangular niches, in one of which is an atlant seated between two lions facing the spectator, and in the other are two human-headed birds. The cornice of the base of the peristyle is similar to that of the Avantisvami temple. The cells were preceded by a row of fluted columns, bases of some of which are in situ while those of others are scattered about in the courtyard. The attention of the visitor is called to the slots in the lower stones of the jambs of the cells. These are mortices for iron clamps which held pairs of stones together. Pieces of much-corroded iron are still extant in some of the mortices. All this essentially means, this Muslim shrine at the temple would now be more that 150 years old. 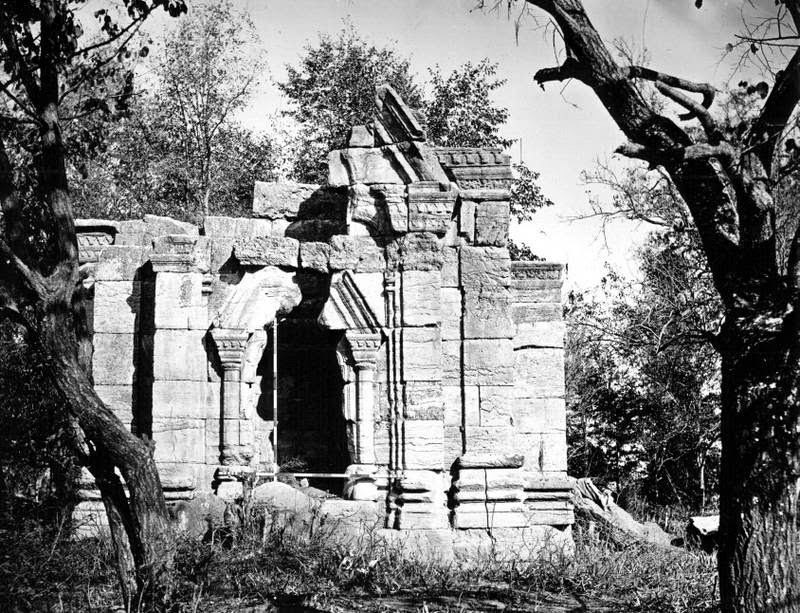 Just as old as Parihaspora was when Sugandhesa Temple and the town of Pattan came up. 1913. Arch. Survey of India. 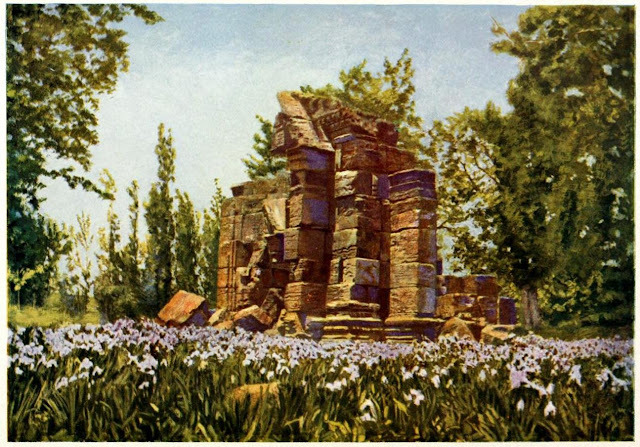 Sugandhesa in 'Our summer in the vale of Kashmir' (1915) by Frederick Ward Denys. Probably by Col. H.H. Hart. Looking at this..breaks my heart. Hope govt reconstruct this tenple like Somnath temple. it was the responsibility of the govt that they reconstruct these edifices but from then 1947 till date govt. never spend on these edifices neither state govt nor central govt. Why is Madin Sahib locked?